The Durham Tech library has ample resources for conducting environmental biology research. Whether you are seeking books, articles, videos or other files, explore the search options on this page to find what you need in your assignments. Your library has over 40,000 physical volumes--mostly books and DVDs--and also subscribes to thousands of online journals, newspapers and streaming videos. Use the tools on this page to get started on your research. GREENR (Global Reference on the Environment, Energy, and Natural Resources) is a good starting place for BIO 140 students. Also be sure to check out the tabs "Finding Articles" and "Video Resources" (above). One particular library collection you may want to browse is the Dr. Phail Wynn, Jr. Special Collection, which is on the upper level of the main campus library. It contains many new books on environmental topics. 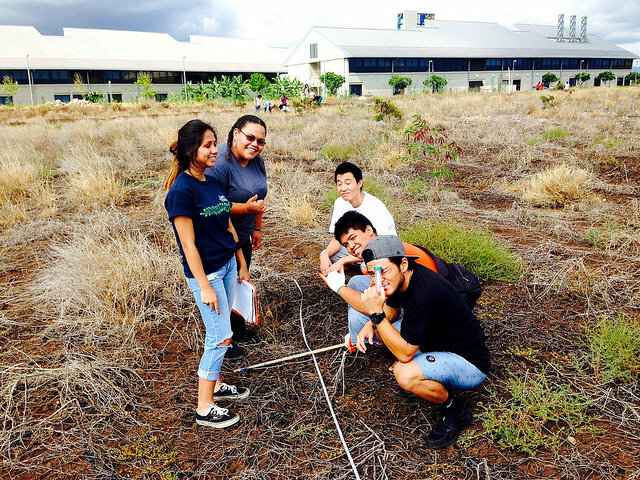 "Environmental Biology Lab Class" by University of Hawaii - West Oahu is licensed under CC BY-ND 2.0. Use the search box below to search virtually all of Durham Tech's library resources simultaneously! Articles, books, e-books, videos and audio files are included in the search. GREENR offers articles, videos, primary research documents and other resources related to the economics, politics, business, health and science of environmental topics. This is a great place to start your research!